Hi Krafty Friends! Welcome to Day # 2 of the Kraftin' Kimmie March Peeks! 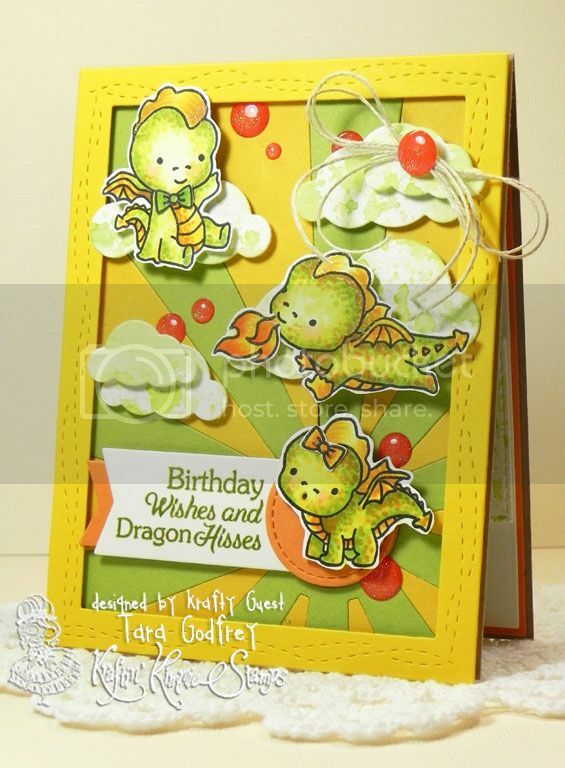 Today is CUTENESS overload...I adore this Darling Dragons Stamp Set by Artist Becky Pearce. These chubby little dragons are ready for some magical creations! The set comes with several main images, lots of cute accessory stamps and four fab sentiment stamps for a total of FIFTEEN stamps in the set! You'll see the new stamps in action and featured in today's blog hop with the Krafty Krew and Guest!! Their links are below and be sure to leave some love at each stop because one lucky stamper from all the comments this week is going to WIN a gift voucher to go shoppin'! ALL of our NEW March stamps will be available on Saturday morning at the Kraftin' Kimmie Stamps Shop!!! Be sure to join us on Facebook for an hour of celebrating the new stamp sets, fun and prizes on Saturday at 11am EST at our LIVE ONLINE RELEASE PARTY!! Come hang out with Kimmie, the Krafty Girls and me!! I coloured up three of the five Darling Dragon images in the Darling Dragons set with my Copics! I fussy cut the Dragons out and popped them up with dimensional adhesive squares on the main panel made with the MFT Sun Ray Cover Up Die-namics cut from Lemon Drop, Sour Apple and Orange Fizz Heavyweight Card Stock. I cut several clouds with the MFT Cloud Cover Up Die-namics from watercoloured paper that I made with the Smooshing Technique and Shabby Shutters Distress Ink. I stamped a sweet birthday sentiment from the Darling Dragons Stamp set in Jellybean Green Premium Dye Ink and embellished with some sparkly peach Gumdrops and Hemp Cord. I finished up the inside of my card too....I stamped a shadow image by masking the sweet little dragon and the cloud balloon accessory stamp. 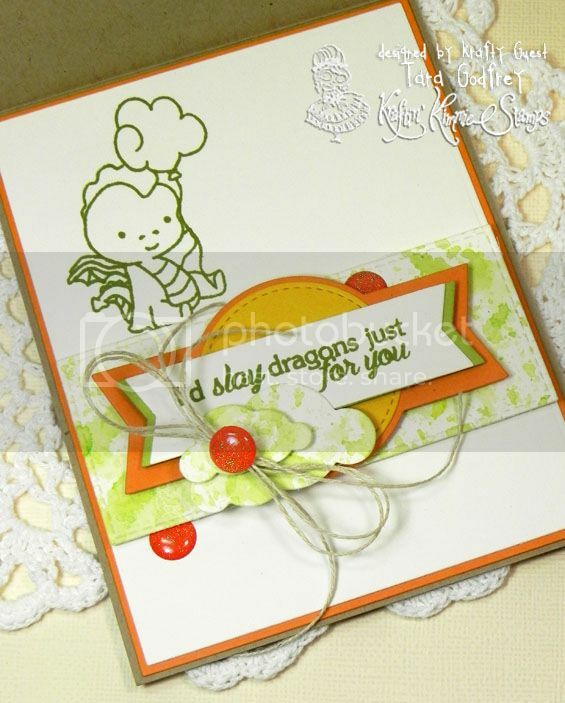 I Stamped another sweet sentiment from the Darling Dragons Stamp set. 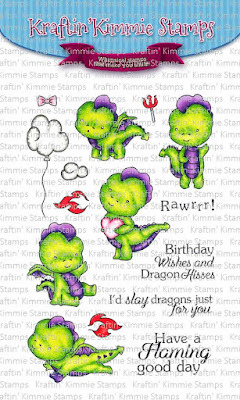 Thank you for stopping by and havin' a wee peek at my card for Day # 2 of the Kraftin' Kimmie Peeks with the Darling Dragons Stamp set! Don't forget to join us on Facebook for an hour of celebrating the new stamp sets, fun and prizes on Saturday at 11am EST at our LIVE ONLINE RELEASE PARTY!! What a cute card! 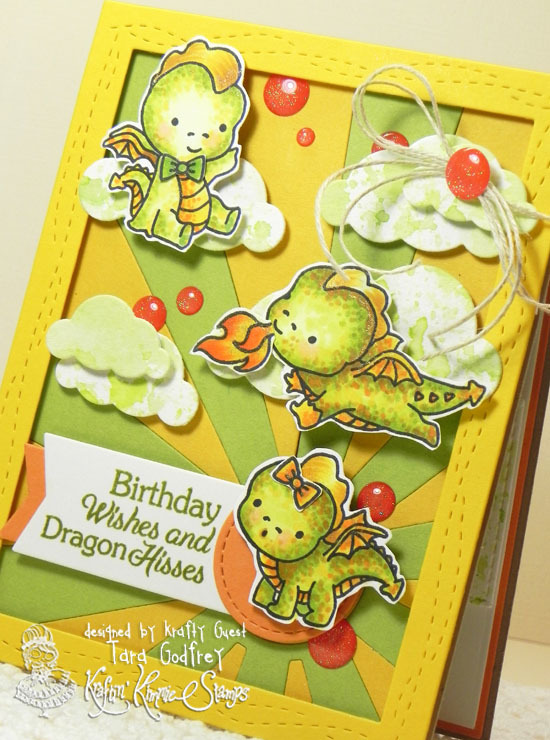 Love the colours your used for your dragons and the way you decorated the inside of the card! I especially love the way you layered the clouds and popped everything up so it looks like the dragons are flying. awesome job - love how its so bright! OH MY!! this is over the top amazing! I love everything about this sweet as can be card! Your coloring and colors, and especially the sunburst background... everything came together perfectly! Goodness!! I 💚 What how you colored those dragons!! Love your card. The skin texture is fabulous! 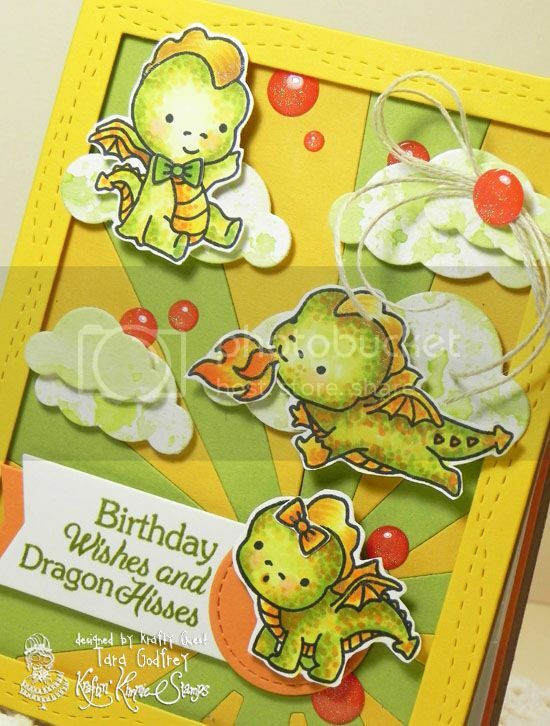 The card is great, love the way you did the texturing on the dragons!! What a wonderful card, love the way you did the inside too! Gorgeous card inside and out!! !